Building on a strong start isn’t always an easy thing, but I’ happy to report that Moreci and Daniel do exactly that. They develop the central mystery of the werewolf, give us a lot more character drama between the main protagonists, and then they just roll off from there so that you are always entertained and even a little freaked out at what is going on here. Like any good horror mystery, the characters involved need to be really interesting, or the story ends up being dreary no matter how good it actually is. Characters make or break a mystery, especially a horror mystery. Here, we have former footballer Laney and his estranged sister-in-law Nora, both of them centrally involved in the recent murders that have terrorised their small town. Laney is hiding a big secret and Nora is leading the investigation in her role as the town sheriff. I love that without directly doing so, the writers built on the character drama between these two characters. This is something that we saw in quite detail in the previous issue so the change in approach is welcome. After that quick introduction and establishing of the conflict, the writers are now focusing on how to move things forward, which I definitely appreciate and welcome. But that’s not all that we see here, because we also get some deeper explanation of the werewolf’s history. It is a chilling tale and one that holds you in its grip while it is being narrated. It adds some perspective to the overall mystery, and hints at what is going to happen next. What really is in store for Laney, moving forward? We see that he is getting blackmailed, but how does that play into the larger mystery. And will the writers take the expected route here that I think they will? I admit that I am very curious on that point. And yes, I know that I am being somewhat vague and disingenuous here, but I think that is warranted, because I don’t want to ruin the mystery here. That would be a disservice I think. What matters is that as far as the writing is concerned, the writers are doing pretty damn good. I am really glad that the series has started off really strong and that is continuing to do so. That doesn’t happen often. Not in supernatural mysteries at least. 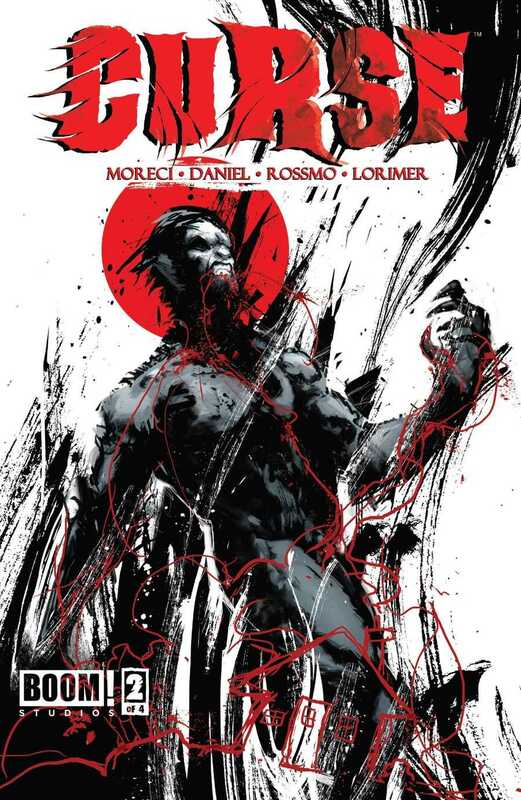 For the art, we have Rossmo and Lorimer returning for a stellar issue once more. Two words come to mind when I think of this issue and this story: dark and broody. Even moody perhaps. There is a darkness to the story that is captured very well by the artists, and it is often quite subtle. It is never in your face, which is another element of the issue that I appreciate and welcome. It is something different to the norm, and that’s the big value of it. The story of the werewolf’s origins is particularly gruesome, and enhances that darkness to the story. It is perhaps a reflection of what is going on in the story in the present time frame. Very neatly handled. Overall, a strong sequel issue and one that I hope heralds how good the next few will be as well. To the creative team: keep up the good work! Posted on February 23, 2014, in Comics Reviews, Review Central and tagged Boom Studios, Colin Lorimer, Comics, Comics Review, Curse, Horror, Jim Campbell, Michael Moreci, Monsters, Review, Review Central, Riley Rossmo, Tim Daniel, Werewolves. Bookmark the permalink. 1 Comment.